When you require litigation counsel to resolve a dispute, there is no substitute for a strong track record. With more than 75 years of combined legal experience, the lawyers of ClouseSpaniac Attorneys have the skill and knowledge to steer you toward a successful result. Our clients trust us to represent their interests energetically and creatively for a wide variety of civil litigation matters. We have an extensive background representing businesses, government agencies, nonprofit social service providers as well as other organizations and individuals in litigated matters in both Superior and Federal District Courts throughout Central and Southern California. Our commitment to zealously protecting our client’s rights and interests has forged lasting relationships with our clients. Strong Community Reputation — Our attorneys have earned prestigious appointments and leadership positions in the local legal community. Area judges and adversarial attorneys respect the high level of advocacy that we deliver to everyone we represent. Practical Experience — We have built long-term relationships with clients because we provide hands-on counsel to solve a range of legal problems. From our years of practice in State and Federal Courts, ClouseSpaniac lawyers understand all of the available options and can anticipate which one will work best in your case. Careful Strategy — Sophisticated litigation demands legal advice that considers long-term repercussions. From the outset, we work with you to craft a detailed strategy designed to achieve your specific objectives and protect you going forward. 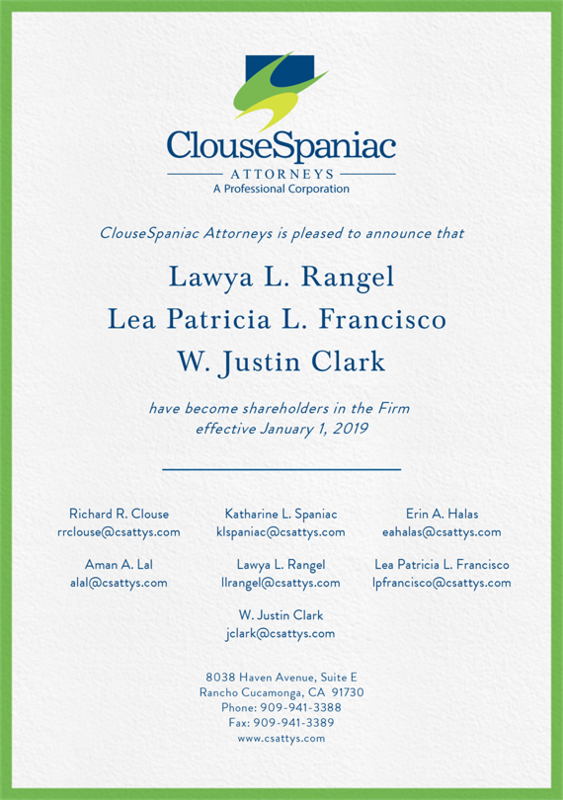 When you work with ClouseSpaniac and experience the exemplary advocacy and service we provide, we are confident that you, or your business, will continue to retain us to meet any continuing litigation needs. Employment Litigation — Lawsuits from current and former employees threaten the viability and continuation of all companies, whether the business is for profit or nonprofit. Our employment litigators guide you through the rocks and shoals of the ever more complex areas of employment discrimination claims, wrongful termination and wage/hour issues. Social Service/Caregiver Liability — We have extensive experience in representing Social Service Agencies, Regional Centers, Foster Family Agencies, Group Homes and other care providers in all types of cases and situations. Civil Rights Litigation — Our attorneys have extensive experience in protecting the people who protect and serve the rest of us: Police Officers, Correctional Officers, Firefighters and other first responders in cases brought in both State and Federal Courts. Disability Rights Litigation — The legislative intent of the ADA was to level the playing field for folks with special needs. Unfortunately, it has become a feeding frenzy for the plaintiff’s bar. ClouseSpaniac lawyers are here to ensure that unfair advantage isn’t taken of companies and organizations who provide reasonable accommodation to those in need of it. Construction Liability — Our lawyers are adept at working with construction and engineering professionals to identify the frequent spurious claims and “junk science” associated with construction defect liability. Appellate Law — Our lawyers have argued before the Ninth Circuit Court of Appeals as well as California Appellate Courts, and have published opinions making law in Social Service, Correctional, Civil Rights and other areas of the law. We have obtained frequent dismissals of cases utilizing the Anti-SLAPP provisions of California law. Our attorneys make the effort to communicate fully with you, no matter what your legal case involves, so that you can make informed decisions on how to proceed. If you employ, protect or care for others in California, ClouseSpaniac Attorneys has your back! Call 909-941-3388 or contact us online to schedule a meeting. ClouseSpaniac Attorneys is located in Rancho Cucamonga, CA and serves Clients in the greater Southern and Central California area.